The folks behind Little Raleigh Radio are Jacob Downey and Kelly Reid, both alumni of NC State and WKNC. Their goal is to bring a mix of music and talk to Downtown Raleigh with a low power FM transmitter that can will reach everywhere inside the Beltline. Little Raleigh Radio is a new community radio project for Raleigh North Carolina. Our dream is open source radio. The idea that every listener deserves to be empowered to have an impact how they hear where they are. Our Mission is to create a radio station that realizes the potential of radio to broadcast the vibration of change in a community by giving voice and value to people and the things they they create. In an era of online streaming music and where the vast majority of commercial radio across the nation is consolidated within just a few companies, local independent radio may seem like an unlikely prospect. However, Downey and Reid both are dedicated to a long-crafted vision to create something uniquely original and local to Raleigh. I have no doubt Little Raleigh Radio will grow into a successful local phenomenon as our other hometown projects have, including Hopscotch, SPARKcon, and Redress Raleigh, to name just a few. We at Goodnight Raleigh would like to congratulate Little Raleigh Radio on meeting the fundraising goal, and look forward to a new level of community involvement and entertainment in Downtown Raleigh. Paired with WKNC, Raleigh will soon have one of the best and most innovative radio broadcasting markets in the country. 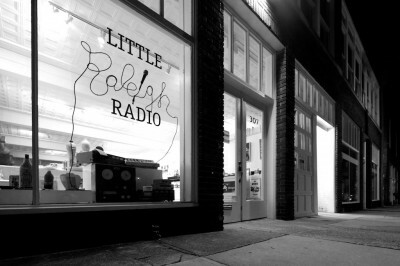 If you’d like to contribute to their campaign to bring broadcast FM radio to Downtown Raleigh, there’s still time to donate at the Little Raleigh Radio Kickstarter page. This is AMAZING. I had no idea something like this was going on. So exciting!